And I realized that no production bike would meet all that criteria, but since I didn’t think I could swing a custom at the time, I filed it away until after I visited Rivendell in January of 2014. Then I got Bob of Bantam Bicycle Works to build it, and on Thursday August 20th 2015 I picked up the built up bike! The specs: I wanted the geometry of the bike to built similarly to the Bridgestone XO series. (This is the big reason why I sold my XO-3 in the fall of 2014, despite maybe investing too much into it. At the time I thought I would be getting the completed bike sooner. Oops.) 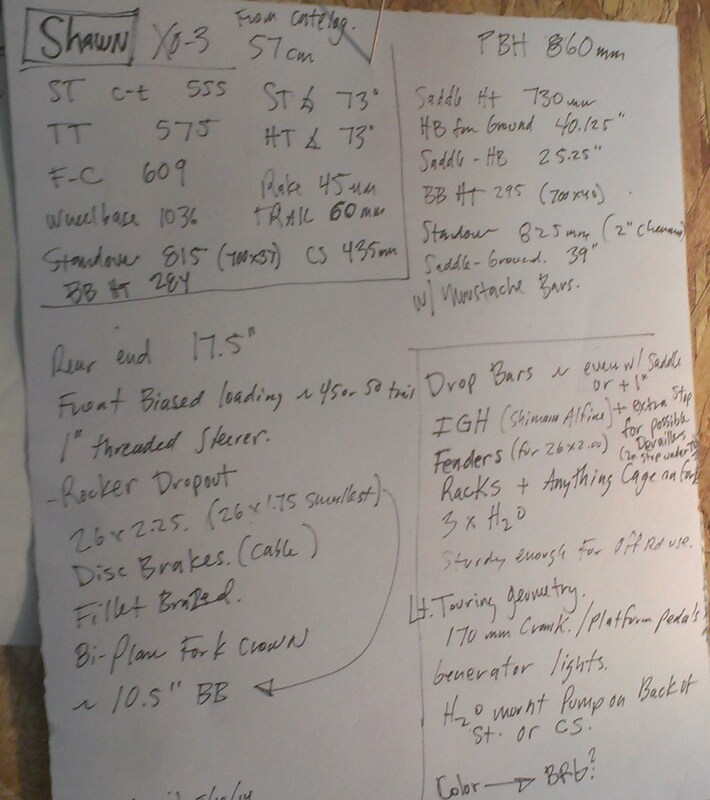 This photo of Bob’s notes says it all. As for the wheels themselves, there’s no way that I wasn’t going to have this bike be built up for dynamo lighting! I got a nice hand-built wheel around a Shimano Alfine dynohub from Citybikes. Sure, I could have gotten a Shutter Precision hub (or nicer) and had a wheel built around it, but one theme you will note throughout this report is that I am not one for high-end bike parts. I go for functional and hopefully not ugly. Unlike a lot of custom bikes, there is no Chris King, Paul, White Industries, Phil Wood, etc. found on this bike. It’s not a diss on their stuff (they are well made, and made in the US), but I only have so much money to spend, and I wanted a bike I could ride NOW, so I go with good and proven. I’ve had good luck with Shimano Alfine dynohubs, so I have no worries about this hub. See Rat Trap Pass tires above. Lucky for you, since it’s got disc brakes, I can easily switch the wheels to 650B and have room for 42 mm tires! Whew! Hell, I can get even crazier and build a nice set of 650A wheels for this bike, but I’m afraid it may give you a heart attack. Drivetrain: Yes, I said this bike would be optimized for an internally geared hub, yet, it has a derailleur right now? What gives? You may remember that I do have in my possession a Shimano Alfine 11 hub, so this should be automatic, eh? But it’s an unproven hub on a wheel that needs to be rebuilt, plus I have to get a shifter (not cheap). So I’m leaving that on the back-burner for now, maybe in spring of 2016 I’ll go for the IGH. So for now I’m going with a simple derailleur drivetrain: Single chainring in front (34 tooth) on old Shimano cranks (170 mm cranks) with an eight speed megarange 11-34 casette in rear with a Deore derailleur, and a vintage SunTour barcon to shift it all. (Bob threw on the front chainring “guide” since he had one lying around.) It works for now and should give me ample range, though my granny will not be as low as it was on the LHT. It survived my big Eastern Oregon tour in September 2015, so I’m in no hurry to switch it out. Brakes: Has the retro-grouch gone crazy? Disc brakes? I know, I know. When I started thinking about my dream bike I wasn’t thinking much about brakes, assuming I’d just have canti/V brakes. But cleaning the very dirty rims on one of my bikes one winter’s day got me thinking about trying out disc brakes. For one thing, I wouldn’t have to worry about cleaning blackened rims anymore (and the subsequent blackening of tire sidewalls.) The other big thing about trying disc was that I wouldn’t have to stick with one wheel size, I could change from 26″ to 650B if I want. Choices! So I went for the most reliable disc brakes out there: a set of Avid BB7’s mechanical disc brakes, mountain version, with 180 mm rotors. The brake levers are the Tektro “long-pull” road levers. Dynamo Lighting: Yeah, I could go with the super-dooper stuff, but B+M has always worked for me, and I scored a good deal on the headlamp last year. I forget the exact model, but it is hella bright. The rear is a fender mounted B+M Seculas. Also bright. Not much else to report here, other than the internal routing for the wiring! What am I, French? The cockpit: It’s been almost two years since I owned a bike with drops, and almost a year that I used a handlebar with multiple hand positions. The idea was this bike would be a return to drops, and the frame is optimized for that. But what drops? Initially I thought about getting another Nitto Randonneur bar, but since this bike was going to be used for a lot more dirt/gravel/rough riding than the LHT, I started thinking about dirt drops. I got an Origin 8 Gary bar, a reasonably priced offering in the dirt drop market. (It also comes in a narrow enough clamp width for quill stems, whereas most dirt drops are made for threadless, i.e. wider clamp area possible.) I really do like this bar. I don’t know how much of it is because I haven’t ridden a bike with drops in almost two years, but it all feels very natural. And to hold that dirt drop, I got a Nitto Dirt Drop stem (my token piece of Nitto on this bike.) Yes, I know, going with a threaded stem in this day in age is also madness! Pure madness. The rackage and braze-ons: One thing you may notice is the sheer volume of braze-ons. I wanted a frameset that would be versatile, something I could set up in many different ways. While having a nice integrated rack or two would be beautiful and useful, I wanted the ability to go rackless if I wanted to. And right now I do intend to do that for awhile, though I don’t know if Salsa Anything cages count as “racks”. So the front fork has braze-ons for fenders and traditional front racks, or those small platform racks, or the three bosses needed for Anything cages. On main triangle there are braze-ons for three bottle cages (two inside, one below the down tube), plus braze-ons for a carrying strap. There is also two other braze-on pairings (non-drive seatstay, non-drive side of seat tube) that can be used for a pump bracket. Options! Other bits: I’m using the same Brooks B-17 saddle and Carradice Camper saddlebag that have been on my Crested Butte, plus the SKS “Grip King” pedals that were on the LHT and XO-3. There is a kickstand plate (kickstand plate!) though I haven’t installed a kickstand…yet. Crane brass bell and yer old generic (Sigma) cyclocomputer. A Filzer bike pump (one of my favorite bike pumps ever!) Right now I have a Rivendell Brand V bar bag installed, plus I have some Randi Jo Fab Big MUT bags for the Anything cages, and when I need it, I can throw on the Jandd framebag. This was a bike built to be “the bike” for me. Hopefully it will last many a year. At the Bike Inn in Mount Vernon, Oregon.